Mi Tribu founder, Marcela Gómez explains why and for what purpose Mi Tribu was created. Mi Tribu founder, Marcela Gómez, was born and raised in Bogotá, Colombia. As a young adult, she immigrated to the United States, but she maintained a strong connection with her beloved home country. While living in the United States, Marcela established a successful marketing firm, raised her family, and become an influential member of her community in Nashville, Tennessee. The answer came quite by accident one day when Marcela was shopping at a local fair trade boutique. "I noticed that there were handcrafted goods from so many Hispanic nations, but there was nothing from Colombia. I immediately thought of the beautiful Mochila bags made by the indigenous women of my country, and from that moment on, all of the pieces of Mi Tribu started falling together in this amazing way." Our mission is to support disenfranchised women in developing nations by helping them establish sustainable means of providing for themselves and their families. We do this by purchasing high quality, handcrafted products directly from the artisans who create them for a fair price. Our goal is to provide our buyers with one of a kind style items that have a truly global impact. Mi Tribu gives back to female entrepreneurs by giving small business loans through the Kiva organization to women in developing nations. Marcela and her childhood friend Gloria with women artisans in Sucre, Colombia. In Spanish, Mi Tribu means 'My Tribe'. We believe that as women, we are all a part of one beautiful tribe; interdependent and meant to lift one another up. To be a part of a tribe is to be supported, known, and seen. A tribe provides dignity, confidence, and a sense of belonging to its member. This relationship is what we offer to both our customers and our artisans. We offer a variety of unique, handmade products that allow our customers to support a wonderful cause and look great while doing it. Our buyers are socially conscious shoppers who value quality and one of a kind style. Where Do We Purchase Our Products? Let's start in La Guajira, Colombia with the Wayuu indigenous ethnic group. The Wayuu reside in la Guajiara, a peninsula of northern Colombia where they have lived for centuries. Their people are located on several reservations throughout the area in settlements of five to six houses. They typically name each settlement or “ranchería” a particular plant, animal, or geographical place. Each ranchería is always far apart from one another as not to interfere with goatherds between nearby neighbors. They communicate with each other through a native language preserved in elder generations known as, wayuunaiki, which is passed on to kids at a very early age. This promotes key aspects such as tradition and family. 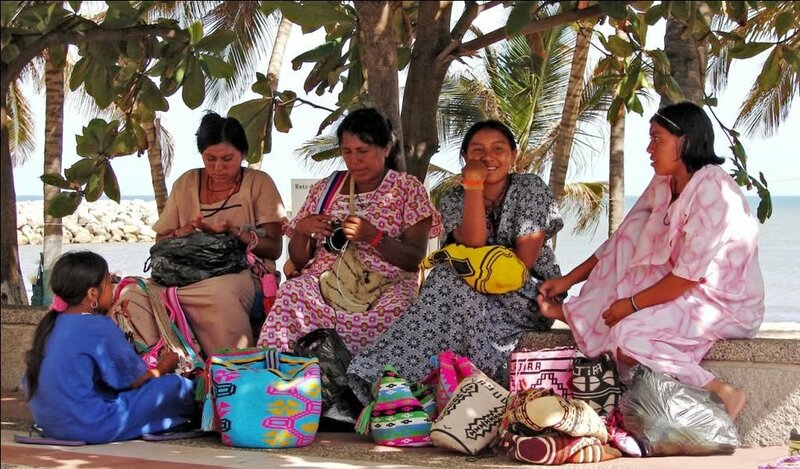 Their unique way of doing things has really shined in their culture generating things like their Wayuu Mochila bags, hammocks, and other articles of clothing. They are like no other people and their Wayuu Mochila bags bring out their incredible personalities with abilities that will be instilled in their culture for many years to come. The beautiful Wayuu women of Colombia. The Wayuu Mochila bags are made by hand. This can be done in one of two ways. They can either be crocheted by single or double thread. Single threads take more time, as the thread is not as thick compared to that of the double thread. Because of this, single thread Wayuu Mochila bags can take as long as two months to be properly crocheted to striking colorful designs. The double thread Wayuu Mochila bags are typically made in as little as 25 days. This process can still vary though. These beautiful bags can be constructed with many different colors and patterns requiring much more time and precision. Solid color bags are traditionally the ones that take the least amount of time, as the thread does not need to be actively changed. Photograph from ELLE Magazine article published in 2016. How to Heal a War-torn Society? Get Rid of Men. San Jacinto is a town and municipality located in the Bolívar Department in northern Colombia. The town is famous as the birthplace of the Latin Grammy Award winner cumbia group Los Gaiteros de San Jacinto. The town is also well known for their mochilas and hammocks. The beautiful and varied mochilas, made from domestic yarn, dyed with natural and organic colors to contribute to the preservation of the planet. When women of San Jacinto are asked how they learned to weave mochilas, their response is "we are born knowing". Passed down from generations of mixed cultural families, including Spanish, African, and Native Colombians. Women of San Jacinto work in arts and crafts to help support their families.